This powerful aromatherapy massage treatment combines several holistic modalities to provide balance and alignment in the body, promoting wellness of one’s physical, mental, and emotional state. Essential oils are dropped onto the body like raindrops, while various light massage techniques are used on the feet, legs, and back to stimulate nerve endings for increased absorption of the oils. The Raindrop Technique® assists in stress reduction, re-alignment of the body’s energy, and may improve immune system responses, and ease muscle, bone, and joint pain. Allow 90 minutes for this treatment. 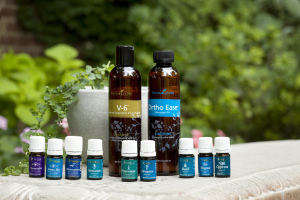 The Raindrop Technique® was designed by D. Gary Young, founder of Young Living, a company that uses only the purest and most powerful plants to bring 100% natural and organic therapeutic grade essential oils to homes and offices across the world. Just like the plants from the ground and trees provided nourishment and health to our ancestors, Young Living essential oils aim to do the same by giving us access to even some of the most exotic plant oils that may be hard to come by in our region. The Raindrop Technique® is a treatment comprised of various non-invasive holistic modalities, such as aromatherapy, massage, and energy therapy. It is designed to promote overall wellness of the body, mind, and spirit by stimulating every system within the body. What Are the Benefits of the Raindrop Technique®? How Is the Raindrop Technique® Performed? The treatment begins with the client lying face up, draped by blankets and sheets for security, with ambient room temperature, lighting, and music all adjusted to the client’s preference. The therapist will begin the session by doing a brief grounding meditation to help initiate the therapeutic energy flow within the body. She will then begin applying various oils to the bottoms of the feet with a technique called Vita Flex. Vita Flex is an ancient Tibetan healing methodology meaning “vitality through the reflexes”. Its theory is based on the fact that slight pressure applied to certain points on the body (the reflex points) creates an electric charge that is therapeutic to the entire body. The technique is similar to Reflexology, only with the addition of therapeutic grade essential oils which can increase the wellness benefits of the technique. Once the Vita Flex technique is completed at the feet, a gentle leg massage will be carried out using Young Living’s Ortho Ease Massage Oil. The therapist will then move to the client’s back where a series of oils will be dripped along the spine like raindrops. The oils are lightly massaged into the body using a technique called Feather Stroking, a gentle effleurage massage technique termed by the Lakota Indians of Canada. The Feather Stroking technique, performed with the fingertips but originally done with a feather, is intended to simulate the healing energies provided by the Aurora Borealis, “the Northern Lights”. The light touch of the feather strokes is believed to stimulate the nerve endings in the body, offering an avenue for deeper absorption of the therapeutic grade essential oils. Once the oils are lightly massaged into the skin, a brief muscular massage will take place, focusing on areas of tension in the client’s back. While the arms are briefly massaged, moist heat will be applied to the back for further absorption of the oils. The treatment will finish with another brief grounding meditation and a blessing for the client’s health and well-being. The Valor essential oil blend is comprised of oils of Rosewood (soothing to the skin and emotionally stabilizing), Spruce (grounding and releasing), Frankincense (oxygenates the limbic system of our brain, elevating our mood and helping us relax and overcome stress), and Blue Tansy (helps calm negative emotions and anger). The blend is carried in coconut oil. Valor as a blend targets mainly the nervous system of the body, promoting a sense of balance and calm, while also helping to re-align the body’s energy system. It can help balance one’s Root, Solar Plexus, Heart, Throat, and Third Eye chakras. These extensive properties make it one of the greatest go-to oils for alleviating stress on both physical and emotional levels. Oregano essential oil is a spicy oil derived from oregano leaves, and has been documented to support a healthy immune system and respiratory health. It can also help release emotional fears and vulnerabilities, and strengthen one’s Solar Plexus chakra – the center of willpower and confidence. Thyme essential oil is another spicy oil derived from the thymus vulgaris leaves, stems, and flowers. Its properties are high in antioxidants and help support the respiratory, immune, digestive, and nervous systems, among others. Thyme can be uplifting to a tired body, and help increase concentration. From a spiritual perspective, thyme has been said to help in times of need when seeking a sense of direction or understanding of one’s destiny. It is also great for balancing the Solar Plexus chakra, as well as the Heart chakra – the love center. Basil essential oil comes from the leaves, stems, and flowers of the ocimum basilcum, and is most well known for its ability to alleviate spasmodic muscles. It also helps to relax and restore muscle health. Aside from muscle aches and pains, basil can also help with fatigue and mental stress, increase alertness, and support the respiratory system. It can be mentally stimulating, helping to clear one’s mind and guide us to explore the inner self. Basil affects the Root, Sacral, and Solar Plexus chakras, offering increased physical strength and energy. Cypress essential oil comes from the branches of the cypressus sempervirens. It has long been known to be incredibly beneficial to the digestive system, as well as offering relief to women experiencing menstrual pain and muscle cramps. Physically, cypress can also be of help for those with oily, troubled skin. Mentally, it is grounding and stabilizing. And spiritually, cypress can increase energetic circulation, breaking up stagnant areas of blocked energy. It also has the ability to help us release what no longer serves us as positive, and embrace the changes that are best for our spiritual growth. Cypress may have an affect on the Sacral and Throat chakras, connecting our creative existence and physical and emotional being with our spoken Truth. Wintergreen essential oil is derived from the leaves and bark of the gaultheria procumbens, and contains many of the same therapeutic properties as birch, namely methyl salicylate – a natural active ingredient that is highly beneficial for tension headaches and soothing muscles after exertion. Because of its strong signature scent, wintergreen is mentally stimulating and can increase alertness and attentiveness, not to mention respiratory strength. Spiritually, this oil is actually said to increase sound vibration levels, making it widely used in meditations, chants, etc. It can also enhance spiritual awareness and love of the Divine and the Self. It is great for expanding intuitiveness. Wintergreen affects the Solar Plexus and Heart chakras. Marjoram essential oil is another oil that is great for muscle tension. It also supports the nervous system and cardiovascular system within the body. It comes from the leaves of the origanum majorana plant. Marjoram can calm nervous tension by relaxing the body and providing mental strength. Spiritually, it is associated with love and harmony, and can also provide ease and security to any negative feelings of transition and change. Marjoram offers acceptance and love. It also affects the Solar Plexus and Heart chakras. Peppermint essential oil comes from the leaves and stems of the mentha piperita, and is most highly regarded for its ability to soothe the digestive system, as well as the respiratory system. It is physically cooling, and can be spiritually cleansing. Peppermint calms the mind, eliminating fear of the unknown, and can encourage learning or moving in a new direction. It affects a wide range of the chakras, including the Root, Sacral, Solar Plexus, and Throat. The Aroma Siez essential oil blend is comprised of oils of Basil, Marjoram, Lavender (relaxing, balancing, and cleansing), Peppermint, and Cypress. It is an excellent choice for spastic or tired muscles, and offers comfort to the head, neck, and feet. Aroma Siez supports the musculoskeletal and respiratory systems, and can be calming yet invigorating at the same time. It helps release tension in both the body and the mind, helping us let go of negative memories and emotions. Aroma Siez affects the Throat chakra. This intense massage oil blend is made up of fractionated coconut oil, wheatgerm oil, grapeseed oil, olive oil, almond oil, peppermint, marjoram, vetiver (grounding and stress relieving), thyme, wintergreen, lemongrass (supports the circulatory system and health joints and tendons), eucalyptus (supports the respiratory system and soothes muscle discomfort), and juniper (naturally cleanses and detoxifies). Ortho Ease can help soothe achy muscles, and in combination with massage can help improve circulation and joint health. 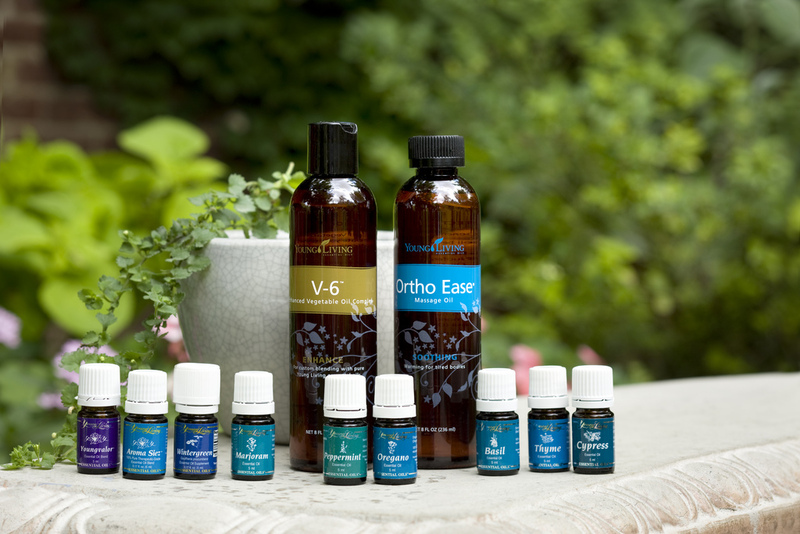 Due to the “hotness” of a few of the essential oils used in the Raindrop Technique® (oregano, thyme, and peppermint), the V-6 oil blend may be used throughout the treatment to dilute the strength of the essential oils and provide more comfort to the client. The Young Living V-6 Vegetable Oil Complex is made of fractionated coconut oil, sesame seed oil, grapeseed oil, sweet almond oil, wheatgerm oil, sunflower seed oil, and olive oil. How Should I Prepare for a Raindrop Technique® Session, and What Do I Need To Do Following the Session? Due to the intense aromas of the essential oils used in this treatment, it is best to wear comfortable clothing that don’t mind carrying the lingering scent of the oils for a couple washes to come. It is also a good idea to wash these clothes in hot water, separately from all other clothing, to release the scent of the oils. Baking soda in the wash may help rid the aroma of the oils faster. For the most therapeutic effect, it is best to allow the oils to stay on your body for 24 hours, so showering is not recommended immediately following the treatment. However the treatment may still be effective if the oils are showered off sooner. Drink plenty of water to hydrate your body’s tissues and continue the detoxifying process of the systems within the body. How Many Treatments Does It Take to See Results, and How Often Can I Receive a Raindrop Technique®? Your own body will tell you how effective the treatment is and whether it is needed again. One may achieve the best results if done in a series – once a week for a month for more severe issues, or once a month for less severe issues. (Ask about Raindrop Packages available.) Of course, due to the relaxing nature of the treatment, it may be done at any time as a single treatment! *Disclaimer: While said to be a highly effective relaxation treatment, promoting wellness across the board physically, emotionally, and spiritually, it is important to note that none of the above information is approved by the FDA and is never intended to treat, cure, or replace any medical treatment. The therapist is never able or allowed to diagnose any ailment or prescribe any treatment. All sessions should be done at the careful discretion of the client and with doctor’s consent.